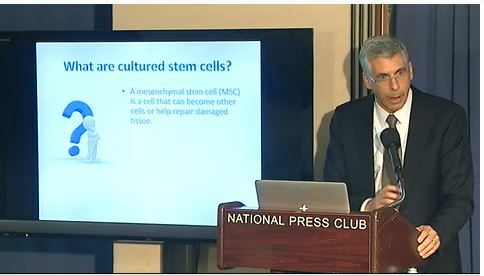 Presented Oct. 9th 2013 at the National Press Club. The FDA is aggressively moving past its lock on the approval of every medication and all medical equipment. It now seeks control of every procedure and treatment that your physician recommends – including your own stem cells. Michael Phelan, a member of PFSC, spoke at this event about the FDA’s regulatory overreach in declaring our own stem cells are now drugs, precluding access to this life saving therapy in the U.S. Frustrated by the limited effectiveness of standard drug therapy for MS, Michael, like many other patients who have run out of options, turned to medical tourism. You can read about his decision in this Forbe’s interview. In his talk he explores the history of the FDA’s encroachment, and what’s being done to win back the right of doctors and patients to utilize this therapy in the U.S. Patients For Stem Cells would like to thank Americans for Free Choice In Medicine for sponsoring this event, and the Association of American Physicians and Surgeons (AAPS) for co-sponsoring. As always, feel free to share this post with your friends, just click the share buttons below. This entry was posted in Take Action on 10/07/2013 by patients.